Actually that might not happen, as the UNLV stadium is not close to NFL standards and would need serious last minute upgrades. Theres been talk of San Diego and San Antonio...as well as possibly playing at Stanford or Cal. Isn't that the color value numbers right underneath? I don't think so. Those are Hex values and RGB values. Regardless, they are the same color, thus the older running joke where any time someone referenced Wolf Grey, a few would respond with 'you mean Patriot Gray - they had it first'. Those are the on screen colors (Hex and RGB). Pantone colors (PMS) different and generally the more specific brand colors. Companies will often have different RGB colors for better use on screen (ie. they don't just change the color mode from Pantone to RGB in their design programs). In this case, I'm wondering if the PMS colors for all these are different but for use on screen they use the same Hex/RGB because that value works better. I think it's wonderful when teams name the same color totally different things. Color names are fun. I'll never forget the fun I had coming up with the color names for my proposal to change my high school mascot, designed entirely by @BrandMooreArt. Sapere blue? Aude orange? Let's get funky with it. This’ll be their first time wearing light blue pants with the new set. YESSS. This is all they should wear with the white jersey. Bills tweeted that they are in blue over white as well. the Patriots are a good example of doing it right. when they re-did their uniforms it was the right time to write in the "new century" story. same for the Rams and "New Millennium Blue" i think it is? if you start with the things, moods, words you're trying to express visually and arrive at a color that makes sense there, thats good design, and it definitely helps sell the idea to the client. i only suspect "wolf gray" is a Nike tactile and the digital value that matches it closely happens to be the same as those other teams. I hate hate HATE that pant stripe. We really aren't going to stop saying "wolf gray", huh? This is their grey! There are many others like it, but this one is their’s! Without them, their grey is useless! Without their grey, they are useless! Just accept that they call their shared grey shade a silly name and move on. It’s no different than giving a car or a computer a name. “Dodger Blue” is just a non-unique usage of 294 C, but nobody tries to lambast them for that name. Oh, I know. I have no idea why it bugs me as much as it does. I know a lot of teams use specific names for their often basic colors, but they don't cram it down your throat by using the name incessantly. I guess I just feel like if you're going to have a color that you constantly refer to be a pretentious name, at least make it unique. 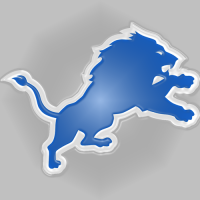 Take, for instance, the Lions' "Honolulu blue". Now that's a name that gets used over and over, but at least the Lions' blue is fairly unique. Imagine, for a second, that the Lions wore the same basic royal blue that the Giants, Bills, and Colts wear, but still insisted on calling it Honolulu blue every time it's mentioned. That would be stupid, and definitely worthy of ridicule. If you're going to insist on using a pompous name for a color, try attaching it to a color worth being pompous about. I think to make myself feel better, I'll just start using wolf gray on all the other examples of teams wearing the exact same gray. For instance, I find it very disappointing that the Giants have gone away from their handsome wolf gray pants full time, and insist on those out of place white ones. Also, wouldn't it be nice if the Panthers wore their wolf gray pants with the white jerseys sometimes. And the Lions sure looked good a few weeks ago when they wore their wolf gray pants in San Francisco. And, thank goodness the Patriots got rid of those ugly wolf gray alternate jerseys they wore a decade ago.